Disciplines: Slalom, Foil, Wave and Freestyle for Men, Wave only for Women. The World Cup Sylt is one of the biggest and longest running windsurfing events on the planet. 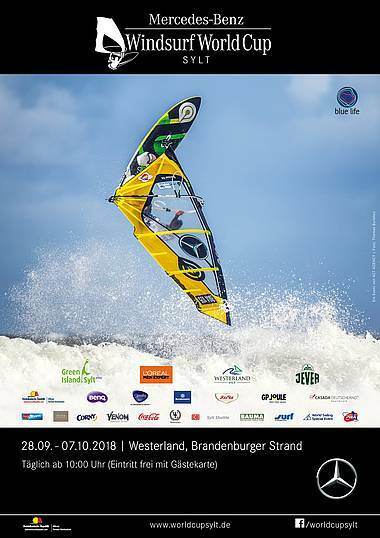 Featuring all of the three main disciplines, 200,000 spectators on the beach, and some of the most extreme conditions The Sylt World Cup is one not to be missed. Westerland can be very tough in onshore winds to get out, due to the shore break. From 3-4m big waves with lots of power to small choppy waves. 3m tide. Be aware of long rock lines (ca. 20m into the sea) every 100-200m from Westerland to Kampen. You can't see them during high tide! But they are marked with a sign on the beach. Strong current when it's coming from South or North. Actually it is no news anymore that the time has come: CO2 reduction and compensation is the most important subject for everyone. Mangroves are the most sustainable, simple and efficient tool for CO2 compensation for every private person and for businesses of all kinds. Blue Life is honoured to spread this information to the world, inviting thousands and millions of people to participate and share. Thanks to Svein Rasmussen and Dr. Arne Fjortoft as our foundation partners of Blue Life, we have developed a system that turns events of all kind into tools for climate protection. This actively involves the competitors as well as spectators and digital users and viewers. The world premier of this system will start this Friday in Sylt at the Mercedes-Benz PWA Windsurf World Cup.